I like to do things a little differently and am always looking for new and creative ways to portray wildlife and this includes foregrounds and backgrounds as well as the main subject when composing my shot, so I was itchy to get out and put this lens through its paces. One thing that really sparked an interest was the f2.8 aperture through the range of the lens and the internal zooming which means there is no change in the length of the lens making it ideal if you are working in potentially dusty/sandy environments. On receiving the lens the first thing that struck me was the weight, it certainly is a beast in that department and I wondered if it would be possible to use it handheld. I received the lens a couple of days before we were due to leave so decided that I would pop out for a couple of hours to get to know the lens before heading off to South Africa. I took myself to a favourite haunt to see if I could find some snakes, on finding an adder hiding in the gorse bush I decided this would be a good place to start. I wanted to show the adder in its habitat so this meant trying to compose a shot that is looking through the thorns of the bush. Both these shots are handheld, taken in colour and black and white. The focal point is the eye of the adder and with an aperture of f4, the thorns just above the adder are in focusing showing their sharpness whilst all surrounding thorns are out of focus giving the looking through the bush into the snakes world appearance. I really wasn't sure if it would be possible to get a sharp image handheld given the weight of the lens, but I am incredibly pleased with these first images and it really started to get my thoughts going about what I could produce during my time in South Africa. Although it is worth mentioning that I only worked handheld with the lens for around 5-10 minutes, any longer I would recommend using a tripod. With these great initial results it was time to go and put this lens through its paces properly. The first stop was the Western Cape for penguins, baboons, lizards and whatever else we could find and time to start getting really creative. Two very different images both with bokeh backgrounds, this lens produces beautifully dreamy bokeh as seen in the black and white image and also slightly harsher bokeh as seen in the colour image. For me the background to an image can make it or break it so being able to produce two variations of bokeh is fantastic, the smooth dreamy bokeh adds a real softness to the pair of penguins on the rock together, whilst the harsher appearance really helps set off the silhouetted penguin walking along the slippery rocks. For both these images I used the fencing to rest the lens on. Away from the great bokeh that can be created, you can also have perfect smooth backgrounds which really make the main subject pop out from the photograph. Both of the above images illustrate wonderfully the smooth backgrounds that can be achieved perfectly at f2.8 making the main subject jump out of the image whilst at the same time giving the image depth. With the rock hyrax (on the right) the ability to blur the foliage in the foreground such that it merges with the background has truly made this image what it is, giving the real sense of the animal peaking around from behind the rocks and plants. For close up portraits this is an incredible lens and offers so much flexibility for being creative with foregrounds, backgrounds and everything in between. But what about picking up a small subject in its habitat? This is where the ability to limit the focal distance using the USB hub really comes into play as you can set two custom settings so I set one with a limited focal range specifically for photographing animals in their habitat. 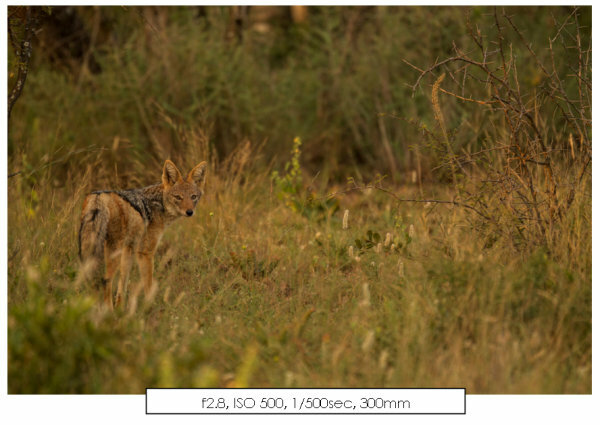 By limiting the focusing range the autofocus wasn't continuously searching. The other option is to manually focus, but as there was no-where to really set-up a tripod my only option was to balance on the fence so manually focusing wasn't an option in this situation. Ok, the penguin was a little easier, but the lens really had no problems at all picking up the rather small lizard in amongst the rocks. Ok, so the lens has performed beyond expectation in the above situations, now for some action shots. It's one thing to be able to have the time to set up and compose a portrait, but when it comes to a penguin jumping, crashing waves or even a baby baboon on the run, then it's a different kettle of fish altogether. 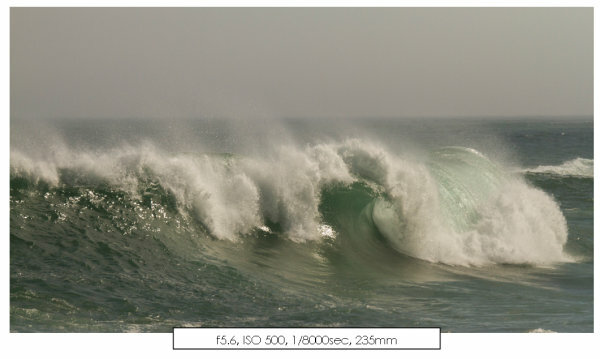 You need to be quick and you need for your equipment to respond in a very short space of time, with crashing waves I had the chance to take over and over. But with the penguins it was a different matter, I found one penguin standing on a rock that was being battered over and over by a crashing wave, I knew the image I wanted but getting it was another thing. This is one of my favourite images, the penguin is in focus and the foam has been frozen in time as it crashes over the little guy. Then there is getting a penguin jumping, I am very excited to say that the lens performed very well in both these circumstances capturing the moment perfectly. 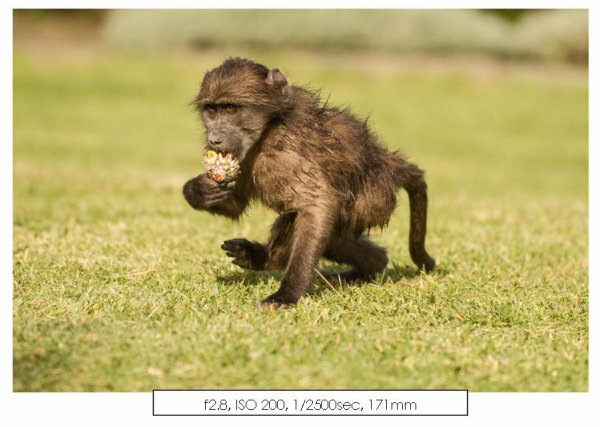 Baboons, particularly young ones, are definitely a challenge as they move quite erratically and fast. I was busy watching/photographing three young baboons playing when this one came running passed eating a protea flower, I have to say I didn't think I would be able to capture this little guy in focus, but the lens focuses quickly (and almost silently) to capture the action when you need it to. Great, very impressed so far. Very responsive, quick focusing, so many creative possibilities to be had. However, all these shots were taken on very bright sunny days. Next stop was to be a different challenge, off to the bush in search of some bigger animals, the light would be more tricky and there would be less time to get the shot. I really did want to use this trip and this lens to explore creative possibilities, I'm lucky in that I have visited South Africa several times, but this time I was really looking for something very different from my photography. Shooting late afternoon with animals that were constantly on the move, elephants and rhinos! I have some wonderful close up shots, but the two I wish to share are slightly zoomed out shots giving the animals some space in the frame. The reason I picked these two images is because they show a different aspect to the other images above. I could have easily zoomed in to 300mm but opted to take a step back and show more of the habitat, even though the aperture is f2.8, because I am further away more of the area comes into focus but still gives me the fast shutter speed to allow a sharp image handheld. Although these were taken late afternoon there was still enough light and luckily it was shining on the animals themselves. But once the sun had gone down I was curious to see how the lens would perform in the reduced light, especially being in the bush. Well, pretty impressive! So there you have it, my experience and thoughts on the Sigma 120-300mm f2.8 DG OS HSM Lens. Creative possibilities - many, many possibilities for creative images at any focal length, this is in part to the option to have f2.8 through the whole range. The lens itself will allow for fantastic bokeh effects and smooth bakcgrounds. Ease of use - very easy to get to grips with, connecting the USB dock allows for easy customisation in several of the settings including speed of focus for autofocus and limiting the focal distances. Not being a particularly techy minded person I wondered how easy it would be to change these settings, trust me it's very easy to understand and change. You can set up two different custom settings. Low Light - performs very well in low light levels, still picking up the subject well. Design - personally I find the design works very well for me, having the zoom system internally so there is no change in the length of the lens is perfect for the smaller person! For me the only thing was the weight, but it was still possible to achieve sharp in-focus images handheld, that is in part due to the great image stabilisation system. If you are using it on a tripod the weight would not be an issue (plus I'm only a small person!). So, I love this lens and if you looking for a multi-purpose lens with good focal range and great creative potential I would definitely recommend this particular lens. I hope you have enjoyed my different take on a lens review! 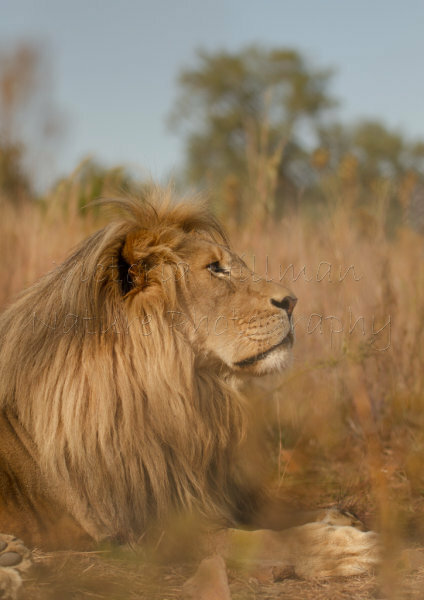 I will leave with one last image of a lion.